Evgeny Golovin, the author of the new animated series Cutie Cubies, Woodventures, F.A.S.T., and of the many other cartoons of Parovoz Studio is recognised as the best producer of the year! Creators of the best Russian cartoons of 2017 were awarded at the ceremony that took place at Moscow Young Generation Theatre on 9 April. Evgeny Golovin, creative director of Parovoz Studio, got the IKAR Award as the best producer of the year for the creation of several successful animated series and their breakthrough to audience. In the past year alone, Parovoz Studio released premieres of such series as Cutie Cubies, Woodventures, and F.A.S.T. under the creative guidance of Evgeny Golovin. Projects are made on request of Digital Television company and are being successfully showed on Moolt, Tloom HD, and Mama channels. One can also find new series of these and other cartoons in Moolt in Cinema anthology and in Moolt mobile app. Woodventures is a musical animated series for preschoolers. The main characters are wooden toys that live in small wooden town. Each character has a home that reflects the personality of the owner. The toys, along with the audience, experience different adventures, overcome difficulties, and always in a playful way learn to be friends and to help each other. In Russia, Woodventures had become popular even before they were showed on TV. Users spent 4,215,831 minutes on Woodventures watching during the first month of showing in Moolt mobile app — this is about 8 years in total! Series got 9 million views in the first month on YouTube! Cutie Cubies is a story about four funny cubic aliens who get to earth after the shipwreck. Here, they meet girl Lera. Everyday cubies explore the world of Earth inhabitants and deal with various life situations — they clean up the room, wash dishes, and make little ships. Parovoz Studio is currently producing 10 animated series: Leo and Tig, Fantasy Patrol, Be-Be-Bears, Heroes of Envell, Cutie Cubies, Woodventures, F.A.S.T., Paper Tales, Magic Lantern, and Rolando Locomotov. They regularly become nominees and winners of Russian and international festivals. For example, Paper Tales and Fantasy Patrol were recognised as the Best Overseas Animated Series at Xiamen International Animation Festival (China). In 2016, Be-Be-Bears series got into the top-15 of the most popular projects of international television market MIPJUNIOR, won Grand Prix of XXI Open Russian Festival of Animated Films as the best animated series, and received people’s choice award at X Big Cartoon Festival. Fantasy Patrol was selected for competition program of Annecy International Animation Film Festival 2017, received an IKAR award as the best startup. 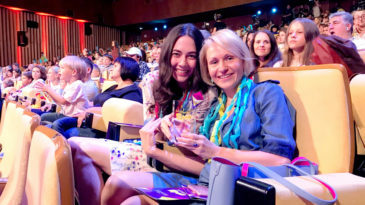 Heroes of Envell has become the first Russian series in history that was chosen for world premiere by organisers of MIPJUNIOR international TV market. The series entered top-20 of the most popular projects of MIPJUNIOR 2017. Russian Animation IKAR Award has been given for achievements in the area of animation cinema and for professional contribution to development of animation from 2014. The awards creation was initiated by Open Russian Festival of Animated Films – the main professional forum of Russian animation. The Union of Cinematographers of the Russian Federation and Animated Film Association are also among funding members. Sergey Kapkov is the artistic director of the award.